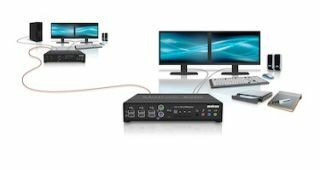 The What: Matrox Avio F120 and F125 KVM extenders consist of a transmitter and receiver pair. The Avio transmitter unit captures I/O functionality of the host computer and sends it uncompressed over a single duplex LC-LC fiber optic cable to the Avio receiver unit, letting you separate the computer from the user environment and place it in a climate controlled machine room. The What Else: With 10 Gbps SFP+ transceivers, Avio enables uncompressed video transmission at full frame rate across a single duplex LC-LC fiber optic cable. Smooth HD, 2K, 4K video allows playback without dropping any frames, and two single-link DVI monitor or one Dual-link DVI display support. Avio has USB HID ports for keyboard, mouse, touchscreens and other HID devices, along with USB 2.0 high-speed support for touchscreens, printers, scanners, hard drives, as well as isochronous USB 2.0 audio and video devices (available with Avio F125).